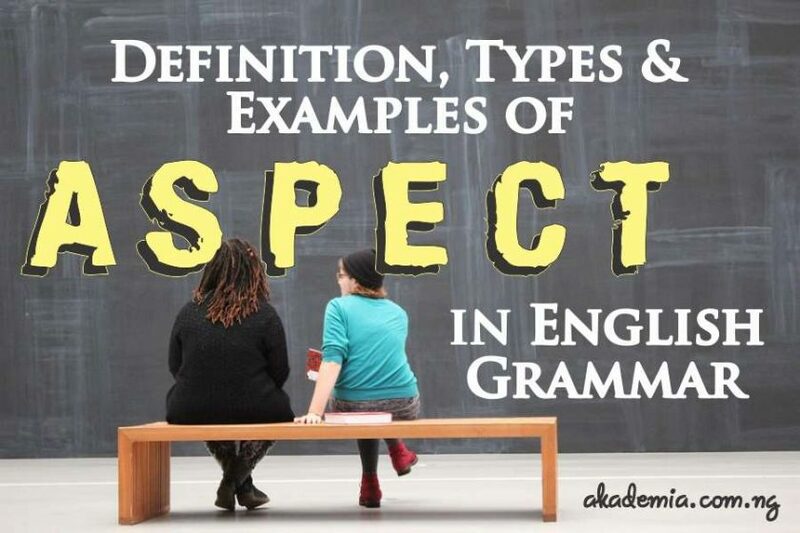 Thank you for joining me on another educative post titled: Definition, Types and Examples of Aspect in English Grammar. Welcome to another time of learning. In my post on Tense in English Grammar, I did say that the form of the verb we use to indicate present happenings is different from the form of the same verb we use when making reference to past time. I believe you still remember. Great! (You might want to take a quick dash there if you cannot remember, as there is nothing great about being forgetful). Okay! But that is not all. What is Aspect in English? I did not tell you about the form of the verb we use when making reference to a state or an action that has begun and is still in progress. I also did not hint on the form of the verb we use in referring to an action that has long been completed before an action that was just completed. Was I hoarding information? Of course not! The reason I did not go into all that was because the English Tense cannot sufficiently cater for that domain of knowledge. There is another interesting grammatical concept that can adequately explain describe the forms of the verbs we use to indicate the completion or progress of an action and that is what I want to discuss with you. We refer to this grammatical concept as Aspect. It is one of the systems in English that occur at the clausal level. Are we good to go? Good! Let’s dive in. Aspects relate to a verb form that shows whether an action, activity or a state is complete or continuing over a period of time. Aspect deals with the placement of an action with regards to time and not necessarily the actual time the action occurs, unlike tense. It is all about the complement of an action that the verbal group describes. Note that the verbal group that can indicate tense, aspect, agreement and mood is finite in nature; and the first element in the verbal group selects for tense (usually the non-modal and modal auxiliaries) while the main verb selects for aspect. Let us examine each of the types in detail. The past perfective aspect (had + verb (past participle). The boy has eaten his food. John and Joe have eaten the food. I have given him the letter. We have submitted the forms. He has mended his shoes. Sometimes, we can add modal auxiliaries. In this case, we have present modal perfective E. g.
She must have gone by now. Peter had eaten his food. Jill and Scott had gone. I had collected the key before he left. We had submitted the forms earlier. She had seen the principal. He had mended his shoes. The past progressive aspect (was/were + verb (past participle). Note again the possibility of adding modal auxiliary e.g. This can also be rendered as Present, Progressive-Perfective. E. g.
The children have been crying all day. He has been dreaming of travelling abroad. She has been dying to meet the singer. We have been coming a long way. The plane has been hovering since morning. I have been eating breakfast. He has been mending shoes. They have been breaking the curfew. We can also have this as Past, Progressive-Perfective. E. g.
The police had been marching since. I had been writing with a special pen. The ship had been sailing on the high seas. They had been competing since their school days. She had been singing for five years. I had been eating breakfast. He had been mending shoes. They had been breaking the curfew. Present Simple: He breaks the law. Past Simple: He broke the law. Present Progressive: He is breaking the law. Past Progressive: He was breaking the law. Present Perfective: He has broken the law. Past Perfective: He had broken the law. Present Perfective Progressive: He has been breaking the law. Past Perfective Progressive: He had been breaking the law. (If he is arrested today,) He will have been breaking the law (for six months). (If he were to be arrested today,) He would have been breaking the law (for six months). Let me leave you with this thought as I round off on Aspect in English. Tense and aspect are not the same but they are closely related. It is possible to have tense without aspect but there can be no aspect without tense! Never forget that! Don’t forget to leave your comments. Check out some other posts and share with your friends. I’m off to work on another post! See you soon! Bye! See other people’s view on Aspect in English. Where do we group aspects of Future tenses? Thanks, Kunle. To start with, based on the structural grammar model, there is nothing like ‘future tense’; though we do have ‘future time’. You may need to read the post on tense for more clarity. This is richly rich, thanks its edifies me so much.